Since multi-grain crust pizzas from Whole Foods came up yesterday in Oliver’s poem, I just want to give you a little update. You’re probably thinking that the feud has blown over, because you haven’t heard about it recently. Last Friday we called four hours early, as we have every week for the last THIRTEEN MONTHS, they told us that they were thawing some out and, in fact, writing a note to make sure the next shift knew about the pizzas, so there “wouldn’t be any surprises”. When we got there to pick up the pizzas, it turns out they had already sold our multi-grain crusts to someone else. Not only were our pizzas on regular crusts, but they also made us broccoli instead of sausage. It would be annoying if it wasn’t utterly predictable. They didn’t even give us a discount! I do find it interesting that the response from the corporate office way back in May was, “Well, you know, it’s really not that popular…” AND YET the number of times we show up to get our pizza only to find it has been sold to someone else. Obviously SOMEBODY out there wants it! Maybe if it wasn’t, I dunno, impossible to actually obtain, someone might buy it? Maybe? Obviously there is no reason to continue ordering pizzas there. We have tried, oh have we tried, to help them get it together. We have vowed so many times to never buy pizzas there, and yet we go back. Why? I guess for the sense of justice? Can you imagine if someone asked you to do something at work, and you were still getting it wrong after 52 consecutive weeks? Can you even imagine? I was hoping maybe things would get better under Amazon, but at the moment I can say the Hyde Park Whole Foods has THE WORST pizza department in the ENTIRE WORLD. Why doesn’t Whole Foods want me to eat their pizza? When the Whole Foods opened up in Hyde Park, we were naturally a bit excited. We’re not every day Whole Foods shoppers, but there are a few things that are more convenient to get there than anywhere else. At first there were some hiccups: mistakes ringing things up, having to remind cashiers about the “case discount” every single time, cashiers not knowing things like which kind of bread you were buying. Now that the store has been open for almost a year, I can report that…absolutely nothing has changed. Whatever opening day hiccups were there, are still there in full force. One particularly humorous aspect to this is our repeated (failed) attempts to order multi-grain crust pizza. If you’ve never had Whole Foods pizza, it’s actually pretty decent. It’s roughly on par with anywhere else we might order pizza from, and cheaper too! Especially on Wednesdays, when they’re discounted, which just happens to be the day the kids have activities until late. A match made in heaven! I would really, really like to recommend it to you, but…. We vastly prefer the multi-grain crust, and they vastly prefer, I don’t know, not to sell it to us I guess? Every time we call, we get a different excuse. It’s become something of a game between Sara and I. Multiple times we’ve gotten, “Multi-grain crust? We don’t sell that. That’s not a thing.” My all time favorite was, “There’s no way you can order that, our ovens here can’t even cook it. It wouldn’t even work.” This despite the fact that we have gotten it there many times AND it’s on the paper menus sitting at the counter. We’ve personally spoke to the distributer about getting more mult-grain crusts ordered. “You should fill out a comment card,” one guy at the counter told us. “That’s the only thing they listen to.” Well, we’ve filled a few of them out too, and it hasn’t made a difference. This past week we got, “You know, for some reason the delivery never came this week, so we don’t have any.” “That’s a new one, right?” I giddily texted Sara. “Better add that to the list.” “You know what?” sighed Sara. “Call them back and cancel the order.” “For real?” I said, but she was for real. I guess she finally hit her limit. By my calculations, we have called to order pizza somewhere in the neighborhood of 20 times. That’s 20 times of having this ridiculous conversation. Why should I have to work this hard to convince somebody to sell me their product? What am I missing here, why don’t they want to make this pizza? Is it really that much harder to make than the regular pizza? 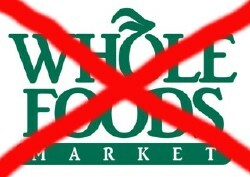 We’re talking about Whole Foods here…shouldn’t they be into multi-grain crust? When I started doing First Friday Food posts, I wasn’t sure exactly what I was going to do with them. I think I had a vague notion of maybe using it to try out new recipes? However, they’ve very quickly turned into a repository for all our best recipes, and I mainly use it to look up all the stuff I need to cook. So, that being said, I can’t believe I haven’t put this recipe up before! I don’t think we go a single week without making pizza. I know a lot of pizza is consumed in America. What do people do? Is it all takeout? Please tell me it isn’t all frozen pizza. Pizza from a restaurant is so different than homemade pizza that, to me, they’re like separate food items. 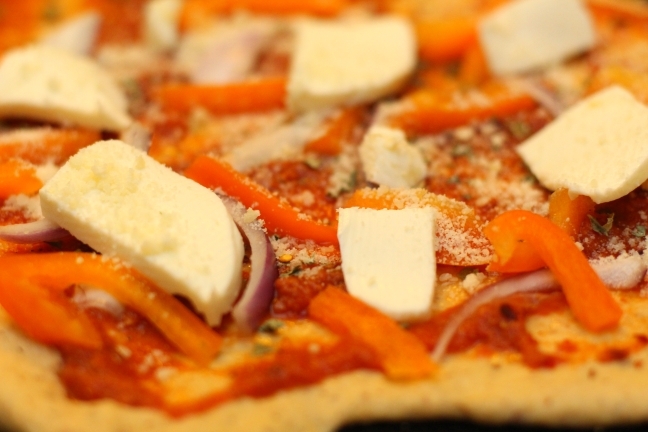 There’s pizza, and then there’s homemade pizza. Entirely different animals. I could have homemade one night and store-bought the next and it wouldn’t seem weird. When I was a kid, we always made our own pizza. It was kind of “our thing” as a family. I remember having friends come over to stay the night and they would be so excited to make pizza. They had honestly never heard of making your own pizza. I remember one year we made personal pizzas for my birthday party. I suppose these days that’s not that unusual, but back then it was a big deal. Kids went nuts. My mom let us put whatever we wanted on our pizzas. For all my friends who thought pizza could only come pre-made, it was like leaving prison for the first time in 20 years and being handed a million bucks. A little too much freedom. I remember some kids putting ketchup instead of sauce, I think maybe even someone put mustard on one, a couple of people went with gummy worms…it was getting out of control. It’s fun to carry on the tradition with my own kids. They love it. We had to buy an extra rolling pin to avoid fights. There’s just something liberating about tossing anything and everything on the pizza. It’s great, because you can use up whatever you have in the fridge, different people can have different toppings and make it just how they want it (Evie has just crust and sauce, that’s it. Nothing more, nothing less (unless there’s bacon)), and it’s never the same thing twice! I mean, what’s there to say? It’s homemade pizza. It’s amazing. Everybody loves it. It’s relatively healthy. It’s pretty easy to throw together. It’s fun. It’s both a food an activity. 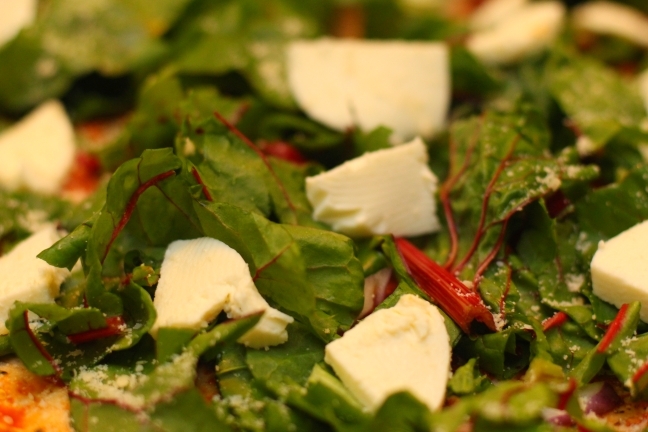 Add everything to your bread machine and run the “pizza” cycle, if you have one. Ours takes 45 minutes and kneads periodically. Allow the dough to rise for about 30 minutes. Preheat the oven to 550 degrees. 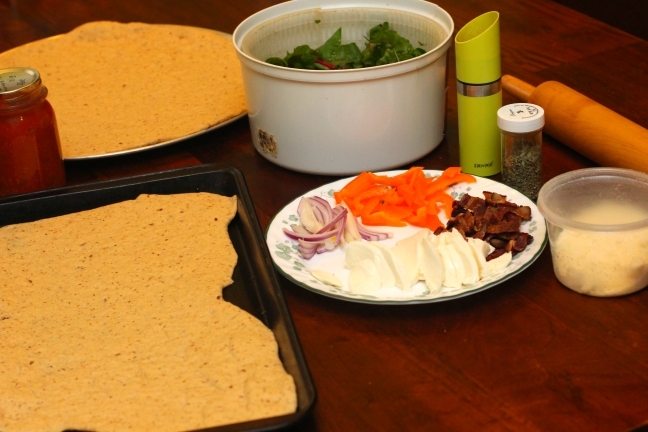 Roll the dough flat and place it on a pizza pan or cookie sheet. 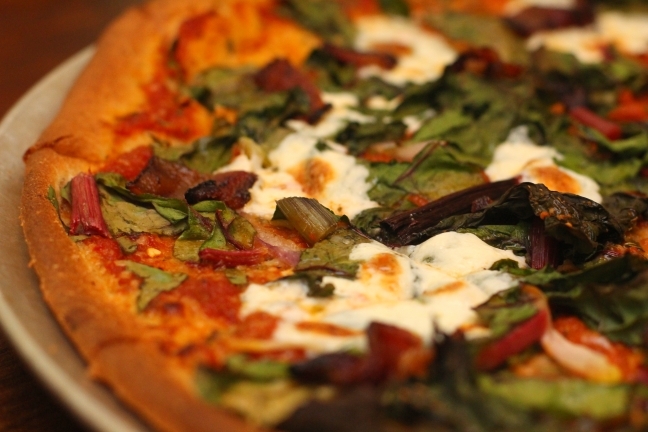 We make two pizzas with this recipe. Add whatever toppings your heart desires. Turn off the smoke detector which absolutely always goes off during this time. Rotate the pizzas and cook for no more than 5 minutes more. Might I add that it only costs $36! I’m not sure about the scale of that picture though, assuming the cigarette lighter plug thing isn’t abnormally large, that can’t be bigger than a personal pan pizza. And even then it’s sort of spilling out of the thing. Oh well, I’m sure I could still put it to good use. If nothing else, pop tarts!